Entering high school is a big deal, but many of us are so busy managing the totally new world of having middle schoolers and the emotional roller coasters that kick into gear during those years (our kids’ and our own) that we don’t even think of what we should be doing to prepare our kids for the next stage until it’s too late. By the time eighth grade rolls in, we’re already running behind, discovering things we should have been doing or paying attention to as early as sixth grade. Yes, I learned this the hard way. That’s why I reached out to a variety of parents who have been through the process at least once before—including some who are educators. 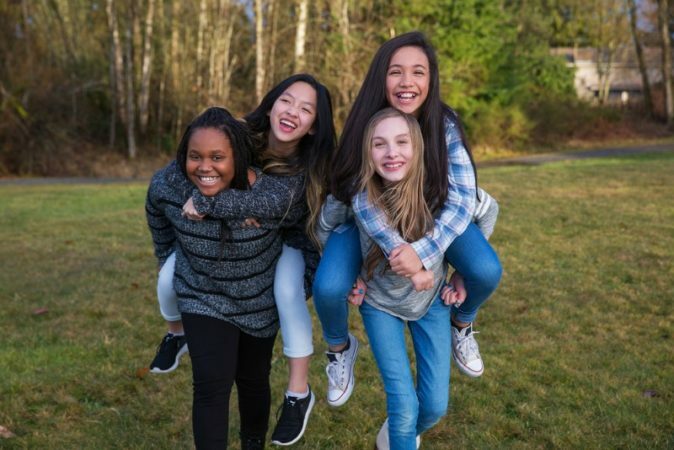 Here are things we parents of middle schoolers should know or consider in order to make our kids’ eventual transition to high school go as smoothly as possible. 1. It’s never too early to start on a STEM track. A deep knowledge of science and math are needed for many career paths these days. Some schools begin integrating STEM (Science, Technology, Engineering and Math) as early as elementary school. If you have a child who seems to be STEM oriented, you may want to kick it up a notch by having your kid join an after-school STEM club, or take an accelerated STEM class at their current grade level that suits their focus. There has been chatter about coding classes possibly becoming mandatory in high school. Have your middle schooler learn basic coding or join a fun club like Girls Who Code. 2. High school math placement is determined as early as fifth or sixth grade. In some schools math is tracked as early as 5thor 6thgrade. This early tracking can set a child up for the their entire math-education trajectory. Yes, often there is the option to switch once they get into high school, but now is the time to pay attention. Are they on the correct track? If they are in accelerated math, make sure they are the ones doing the work, not you. Otherwise, they will struggle once they get to high school. And if you believe they belong in a higher level, now is the time to advocate for them before they get too far behind the higher level. 3. Start taking grades and attendance seriously no later than seventh grade. Consider this the year that things get real. By now you want your kids to take ownership of their homework, projects, and grades. Missing a few days of school can make it hard for them to catch up. It can hurt their grades and make it tricky for them to keep up as their lessons build upon the segments they weren’t around to learn with the rest of the class. If you’re thinking, “but they’re just a middle schooler—let them enjoy a little extra vacation time,” keep in mind that many specialized or private high schools look at those transcripts in their applications, and public high schools look at transcripts to determine a student’s educational track. 4. Keep trying new extracurricular activities. Middle school is a wonderful time to try new things. Not only does it give them a few years to see what works for them, it gets them into the practice of trying new things and meeting new groups of people. Once they’re in high school, keep it up; have them jump into at least one new club/activity freshman year. 5. Prepare them for how different sports will eventually be. Even if they are good at their favorite sport that they’ve played since they were four, that doesn’t mean they’ll make the team at fourteen. Often the league or club is completely different, or the teams are much more difficult to get onto because freshman are competing against far more physically mature athletes for the same spots. There might want reconsider being on the team if they’ll only be a bench warmer. Is there another club they can try out for on which they’ll get real playing time? If your student understands this and still wants to make a team known for being tough to get on, now might be the time to consider specialized or individualized training for the sport. That being said, there is usually a new slew of sporting options available in high school, so your child might surprise you by deciding to try something completely different. 6. Start looking into all of their high school options a year or two before decision time. When your student is in sixth grade, start the search, even if you’ve never considered sending your kid to a different high school than the one you drive by every day. You might be surprised to learn that a local “private” high school is actually free to the public—but with an application process, or that there are hidden gems not too far away that might be exactly what your student needs to excel during their high school years. Find out now, so you know what they’ll be looking for when it comes time to apply. 7. Do not have the mindset that freshman year is a “warm up” year. And don’t let your kid think this, either. The first year of high school is meant to be jumped into in every aspect. Ninth grade transcripts go on college applications, athletics and clubs can become integral to making the years more fulfilling and fun, and friends made then can sometimes become friends for life. Every day matters. 8. Be realistic about what they will be exposed to. Yes, “stuff” happens in the upper grades of middle school, but the difference between what a student is exposed to there and what they are exposed to starting in ninth grade is a totally different ballgame. Vaping, drinking, partying, sexual experimentation—they will have a lot more access to it all once they’re swimming in a pool with older kids. Have honest conversations about these things before they’re thrown into the deep end. Trust me, these are talks you want to have too soon rather than too late. 9. Independence can be the greatest tool you supply your kid with. At some point in middle school, many of us realize that we’re still doing things for our kids that they not only can do on their own, but should be doing on their own. Both at school and at home, arm them with the information and skills needed for them to take more responsibility in managing their academics, sports, extracurriculars, social life, and home duties, then let them take the lead. There will be a learning curve, so keep an eye on them to give guidance when needed. 10. If they want something, have them earn it. Kids get used to asking, bartering, or guilting you into getting them things. Shift gears and get them into the practice of earning what they want, whether it’s grades, a three-pointer shot, or a new video game platform. This means sometimes they won’t earn it and will feel bad about the failure. Let them experience that bad feeling, think about what they could have done differently, make a plan to succeed next time. Eventually, learning how to focus on a goal and earn it will become a habit that makes many facets of the high school years a lot easier to manage. 11. Be an informed and active advocate for our kids. This means we need to be joiners and listeners. Schools won’t spoon-feed us the information we need, but that doesn’t mean it isn’t easy to get. Join the PTA, subscribe to the newsletter, check the school website, join the school social media groups, get the apps, reach out to parents of high schoolers for advice; what we want to know is out there, and it is up to us to go get it. It’s our job to take advantage of the resources available instead of complaining that nobody tells us anything. Doing this allows us to become the best advocates for our kids when they need us to be. 12. But remember this is our KIDS’ high school experience, not ours. From the work we begin in middle school all the way through to them finally becoming freshman, we must keep coming back to their individual needs. They will be the ones walking the halls, the ones becoming strong, independent young adults on their own two feet. Starting now, let’s keep the honest conversations going to ensure we’re working together to prepare for and cultivate a high school experience that is right for them—not a copy of our own, or a chance to have the one we never got to enjoy. We need to let them guide us, tell us when their gut is pointing them in a direction we never thought of, and trust them to ask for our help when they need it. Sometimes our kids will not want us to advocate for them in the way we want to, so we simply need to find another way to be there for them while they figure things out on their own. It’s the part of growing up that we’ve known was coming for a long time now.